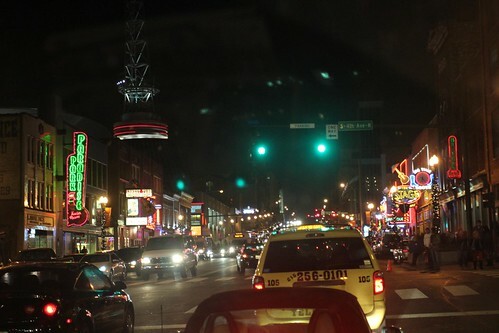 Mali Mish - Day 98: Back to Nashville, Tennessee. 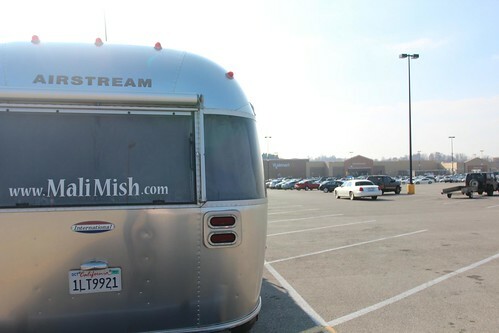 That took us to our last night stay in Kentucky at the Walmart in Glasgow. From today on, we will not be visiting any more new states. That means our ‘Visited States‘ map is as complete as it is going to get until another trip. Of course we could make a quick detour up to Virginia on our way to Asheville just to add it to our map but that is not what our trips are about. We are not out here to collect states on a map, we are here to see them, learn about them and sometimes live in them like locals. We have been doing exactly that in the last couple of months. It has taken us a long time to get through Michigan, Ohio and Kentucky. In hindsight, we will be glad that we spent the time we did. Not only have we met some new friends who we will probably be friends with forever, we also got to really know what it just might feel like to live there. As a matter of fact, we are looking forward to Mississippi and Alabama. Both of those states we breezed through two years ago. They are technically on our map but we know very little about them. We will try to make our trip through them this time really count. 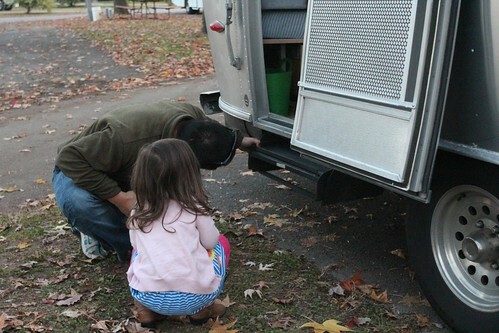 Before we got moving this morning out of Kentucky and into Tennessee, Ava did a little school work. For moral support, Mila sits next to her and watches a movie while sucking on her night-night fingers. 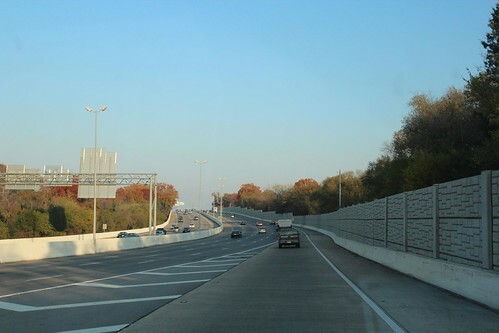 We are heading southward into Nashville this time as compared to our northward trip from Lynchburg two years ago. Tennessee if one of my favorite states in the union. Nashville is obviously a place that is full of culture and entertainment, but I also love the geography of middle and east Tennessee. It is far enough south to not have terribly cold winters, yet it is close enough to the mountains to not be bothered by tornadoes to the west. The hurricanes of the southeast are blocked by the Appalachians and above all that, it has no state income tax and after that helpful explanation of pan we realize that it has a very reasonable property tax. 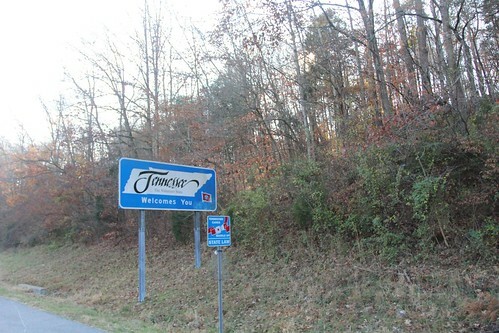 You might be thinking, ‘wow, Tennessee is a great place to live!’. Yeah, I think so too. But just to be sure that you are okay with the religious aspects of life here. 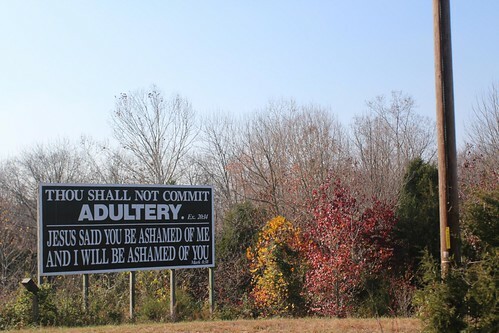 After all, we are in the heart of the bible belt. 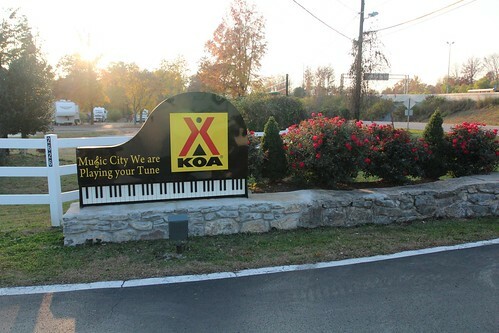 Our last trip here, we stayed at the Nashville KOA. 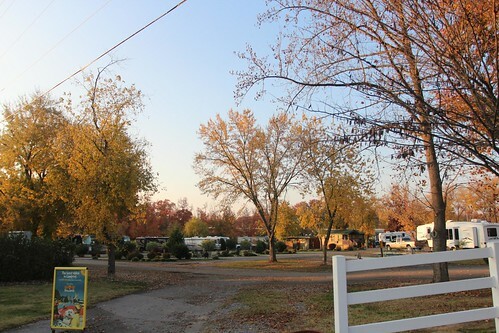 It is one of the closest campgrounds to town and right next to the Grand Ole Opry. 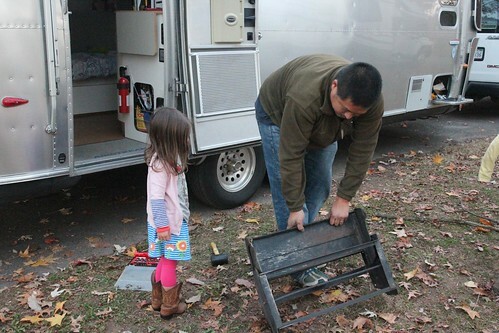 As it was just after the flood, the bottom half of the campground was totally damaged. After evaluating our options, we decided to stay here again. When we called them on the phone inquiring about their camping fees, it was very reasonable for a large city campground at $30 a night with water and electric. One of the thing I dislike about staying at a KOA is their pricing. When you make a reservation online, it seems to be a totally different rate than if you call. When we walked in to the office, they actually quoted us for the exactly same site at $60 a night before I told them that I had just been given a quote of $30. When we pulled into our spot, Marlene suddenly noticed that our steps have been severely damaged somehow. Since we didn’t lower the steps last night at Walmart, we didn’t pay much attention to how they looked. In retrospect, I remember turning into the parking lot of a church near Glasgow, KY as we were trying to decide where we should go. On the way out, we must have taken the corner a bit too tight and the steps might have hit the side of the road as the tires dropped briefly into the ditch. I was able to unscrew the 4 bolts that hold the steps in place and lower it from its place to take a closer look. This is after several minutes of me attempting to bend it back so it can even open again. All those burgers and hot browns I have been eating are finally paying off today. I had to use my entire body weight to push and bounce against the steps assembly to get it straight enough again so I can mount it back on the Mish. That was probably the most strenuous thing I have done in months. I know my body is going to feel it tomorrow. 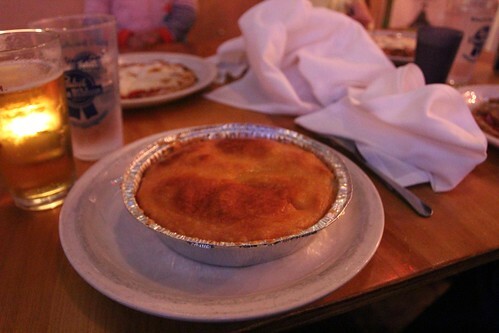 I only know one thing that will make it all better, some good old southern country food. We had wanted to try something new this time around in Nashville so we asked our friends on Instagram where we should go. 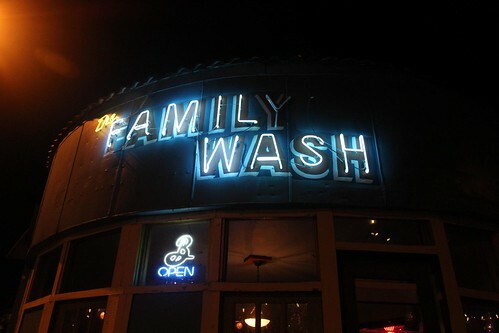 After getting tons of great suggestions, we ended up at The Family Wash. 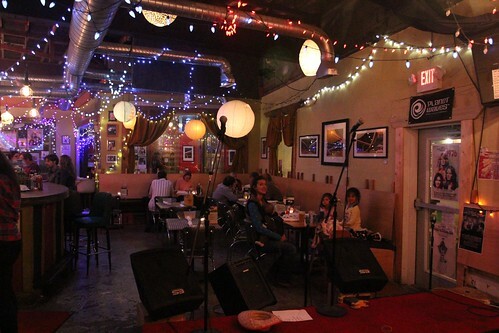 This place is known in town as more of the music venue than a restaurant. There is live music pretty much every night and they serve lots of great beers on tap. With our three kids, we typically don’t get to come to places like this. Since we are here relatively early in the night, there was no music playing yet. Although we did get to pretend for a moment that we might have some semblance of a night life. At The Family Wash, they are known for their Shepard’s Pie. I am not a connoisseur of the Irish meat and mash potatoes treat but I did thoroughly enjoy it. Maybe it’s just the IPA talking but I would definitely go back again. 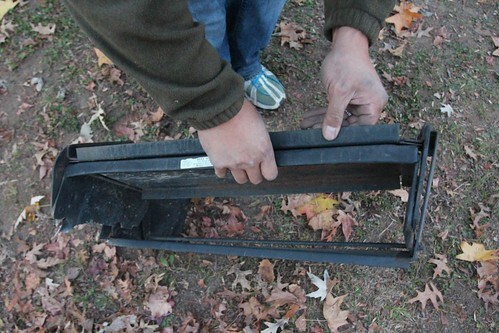 One Response to Day 98: Back to Nashville with broken Airstream steps. Hey Dan, glad you got your steps fixed. If at the most you might find a shop that has a vice- such as a welding shop. We keep ours retracted as I do not fully trust them, and figure they could give if you stepped too hard or whatever. so we use other means of platforms, If you ever go down towards Memphis (my old stomping grounds) There are tons of things to see. Memphis has a auto noise law and is a very quiet city. And nearby is an old old place called the Lucy Opry.